SBEM Calculations have been defined by the Building Regulations as a method of showing compliance with Part L: Conservation of Fuel & Power, of Building Regulations for non-dwellings, otherwise known as commercial property. The calculations seek to demonstrate that the actual building concerned performs better than a notional building, in terms of efficiency, that conforms to the current standards set by the Building Regulations. 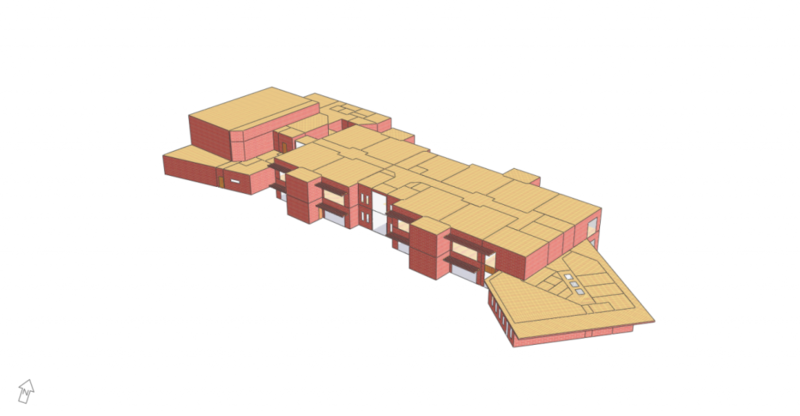 The notional building is the same shape and orientation as the actual building and the activities performed within each individual zone are also identical. The only things that differ are the percentage glazing used within the calculations and the mechanical and electrical installations such as heating, cooling, ventilation, hot water generation and lighting. The notional building will produce a Target Emission Rate (TER) in KgCO2/m² per annum. As this suggests, this is a target which the actual building must not exceed in order to demonstrate compliance with Part L of the Building Regulations. The actual building will produce a Building Emission Rate (BER), if BER ≤ TER then the building concerned complies with regulations. There are a few other requirements in order to satisfy Building Regulations, such as limiting u-value standards in W/m².K for all external elements, efficiency of heat sources, power consumed through mechanical ventilation, lighting and air tightness of the building. Producing a building which merely complies to minimum standards will almost certainly not be enough to give a successful outcome of any SBEM calculation. Building Regulations 2010 have sought to vastly improve energy performance of new buildings and minimum standards must be largely improved upon to achieve a positive outcome. Whether it is improved u-values, air tightness or lighting efficiency that are implemented, a situation of ‘robbing Peter to pay Paul’ is often the situation which we see at BSE 3D on a regular basis. On many occasions, buildings will not pass without the introduction of renewable energy such as Photovoltaics, Air or Ground Source Heat Pumps, Solar Thermal or Combined Heat and Power (CHP) Plant. All of these can be modelled into the calculation tool to identify the most appropriate solution for a given site and client. BSE 3D have a wealth of experience in achieving compliance for a whole manner of different building types from schools and hospitals to high rise office blocks, datacentres and large hotel developments, to flagship industrial facilities. Whatever the scheme, we will find a solution. BSE 3D have engineered bespoke systems to allow buildings to recover heat energy from other processes and have successfully integrated these designs into hotels, hospitals, casinos and manufacturing buildings. Please visit our services page for more information and a full list of services we provide. Alternatively, please contact us at enquiries@bse3d.com with any queries you may have.